Underwater photographers just love strange looking fish, in fact the stranger the better it seems and we spend small fortunes travelling the globe to find and photograph them. This is all very well if you can afford it, but what can you do if you are limited to our own temperate waters? There are a few candidates here which include monk fish, gurnards, pipefish and scorpion fish. But perhaps the strangest and most striking of all is also potentially to most cooperative photographic subject which, once discovered, you can return to for several weeks to perfect your shots - I am of course referring to the lumpsucker which frequents our shallow reefs in early spring. Although the lumpsucker (Cyclopterus lumpus) is quite common in our temperate waters, it is not often seen as it spends most of the year in deep water until it is time to breed. Early to mid-spring is the breeding period for these fish, when the female lays her eggs, often in a mass of more than 200,000, in shallow waters - normally among the stypes of kelp or in some fissure in the reef to protect them from heavy swells. She then abandons them to the tender care of her mate, who stays with the eggs until they hatch. Beauty is in the eye of the beholder of course, but for me these fish have the same attraction as say a frog fish and are generally equally co-operative. The bright orange/red breeding colours of the male are very striking. Nikon F801, Subal housing, 60mm macro, Fuji Velvia, f11 @ 1/60th, YS50 and home made slave. Male lumpsuckers spend most of their time with their egg mass gently blowing freshly oxygenated water over their offspring. They will however leave every now and then to chase off predators, particularly hungry wrasse, and these moments present a chance to shoot them in open water. Nikon F801, Subal housing, 16mm fish eye, Fuji Velvia, f5.6 @ 1/60th , Subatec S100 1/4 power. This close up shot shows the male hard at work puffing fresh water over his brood. They seem to do this tirelessly and often concentrate on one area for long periods, creating a depression in the eggs seen here. Nikon F90X, Subal housing, 105mm macro, Kodak EBX, f11 @ 1/125th , Inon Quad flash. In this shot the eggs are quite close to hatching. The eyes and tails of the young fish can be clearly seen. Although I returned for several days after this stage of development I missed the moment they hatched and all the young had departed. Nikon F90X, Subal housing, 105mm macro and Nexus wet lens, Kodak EBX, f11 @ 1/125th , Inon Quad flash. The incubation period normally lasts for 4 weeks or more, during which time the male lumpsucker will almost continuously oxygenate the developing eggs by puffing water over them, and see off predators seeking an easy meal. So it is normally the male lumpsucker which divers encounter, which changes colour for breeding from a drab greeen or brown to bright red to orange livery which makes him much more photogenic. Beauty is of course in the eye of the beholder, but whilst most divers might consider the lumpsucker to be ugly or even grotesque, to a photographer he is a thing of exquisite beauty! 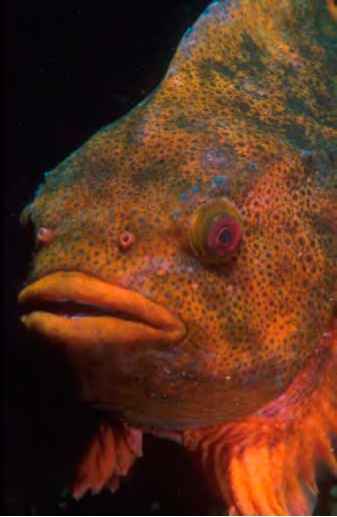 The lumpsucker can be quite large (25-50cm) and sports a large, square, bony head with bulging eyes and thick lips. The body, covered by stout spines, tapers sharply to a stubby tail while the pelvic fins are hand-like. The lumpsucker's somewhat strange name is derived from the fleshy fin or pad on the belly of the fish, which it uses to secure itself to the reef close to the eggs the fish is tending. This remarkable looking fish has a docile and fearless nature, and seems quite happy to strike poses for the persistent photographer. 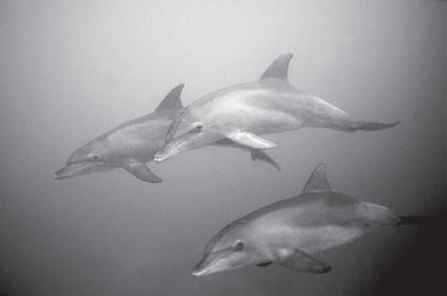 As with any subject, having a diver in the picture can enhance the shot, add scale and perhaps add to the story of the encounter. You must of course be careful not to disturb the fish, but my experience of these creatures is that they don't see divers as a threat and all but ignore you as they continue their ministrations or see off predators. Nikon F801, Subal housing, 16mm fish eye, Fuji Velvia, f5.6 @ 1/ 60th , Subatec S100 1/4 power. survive stormy conditions - on one particular site the water depth to the nest was only between 2-3m on a low water spring and the fish was still there after a force 8 gale! In addition to oxygenating the eggs the male also has to defend them against hungry predators. Starfish and crabs try to creep in for an easy meal whilst wrasse and reef fish like the tom pot blenny are a real danger and need constant chasing off. There is also danger from above, particularly at low water when it is calm as often sea gulls will target both the fish and the eggs from the surface. So it is hard work for the poor male and he often does not feed for the duration of his vigil and sadly many males do not survive their dedicated care of the next generation. In their run down condition they are an easy target for parasites and you will often find the fish covered in sea lice after two or three weeks of incubation. Once you have been lucky enough to find your quarry you can relax a bit as you know the fish will be there for between 3-6 weeks. This provides the opportunity to make repeated visits to the nest over say two weeks to perfect your shots and perhaps even witness the hatching of some of the eggs. As they develop over the weeks you able to see the development of eyes and movement in each tiny globe, but sadly I have so far missed the moment they hatch. Once the young have hatched they continue to develop in the shallow waters or occasionally they will attach themselves to the father to be carried to deep water. The young fish are dark green to brown and look a little like tadpoles and will often be found clinging to kelp stypes or fronds. Each visit will give you the opportunity of using a different lens and look for a different perspective on the subject. A 60mm or short zoom is ideal for portraits of the fish, whilst a 105mm allows you to concentrate on detail shots and perhaps on the eggs themselves. TTL exposure works well for these shots, although my experience is that the skin of the fish absorbs light and you may need to open up a stop or two from your usual settings at close range. Calm days with a little sunshine are ideal for a 20mm or even a 16mm fish eye as you can get very close to these fish for a shot which include the nest and the surrounding reef environment. The lumpsucker will often leave his nest for a short patrol of the surrounding reef, particularly there are predatory fish lurking nearby that need chasing off. These movements offer the chance to shoot the fish against an open water background as he returns to the nest, perhaps with a diver and maybe even a hint of sun if you are lucky. Nesting sites seem to be a once only affair as I have yet to find a pair that have returned to a location the following year, so the search has to start all over again. However, it is worth it when you find one of these glorious fish and even if you are unlucky your close attention to detail on the reef is bound to turn up other worthwhile subjects.